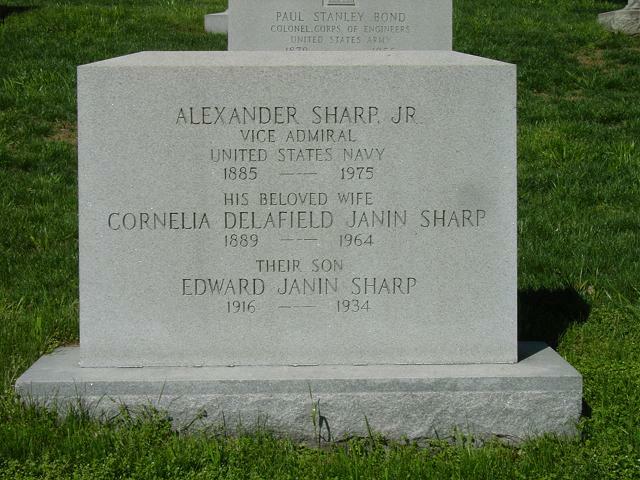 NOTE: The Admiral's father, Alexander Sharp, Sr., Captain, United States Navy, is also buried in Arlington National Cemetery. His son, George Hand Sharp, Captain, United States Navy, died on 3 January 2006 and is also buried in Arlington National Cemetery. Michael: I'm a retired (2003) Navy Commander who e-mailed you a few years ago while assigned to the Pentagon. I saw that your listing for Vice Admiral Sharp requested any available new information, so when I saw this obit in the Washington Post earlier this month I thought you may want it. Interestingly enough, when I was in high school I lived in Bethesda, Maryland, and worked summers at the Naval Hospital (1970-74), one day while working in the emergency room they brought in an old gentleman who was obviously suffering from dementia among other things. As he sat up on the gurney in the treatment room waiting for the doctor, he kept repeating in a commanding type voice "Admiral Alexander Sharp" followed by, in an informal friendly voice, "Sandy Sharp" (as if by way of introduction), he kept repeating this numerous times while i was there. As a young kid I never forgot that because he seemed so distinguished and otherwise "normal" for his age. When I saw his name listed on your site the memory came right back, then when I saw this 2 weeks ago I just had to pass this on. I'm now working as a contractor for the Chief of Naval Operations so let me know if you ever need a hand with information. Keep up the great work!